Ajaz Akhtar is a key Barnack player. Relegation from Division One of the Rutland League will be confirmed on Sunday (September 17) with four teams still in danger. The big game is at Barnack who host Market Deeping. The losers of that game will almost certainly go down, but a defeat with plenty of bonus pooints for the home side could still see them get past Peterborough Town or Grantham. Market Deeping's Rutland League captain Chris Jones. Town have finished their fixtures, while Grantham host Nassington. Stamford Town are already relegated. Wisbech Town are the champions. Easton-on-the-Hill will win Division Three West if they pick up 19 points from their game at home to East Carlton. Peterborough Town finish their Northants Premier Division season at home to Geddington tomorrow (September 16, 11.30am). Second place is the best finish they can manage. The Lincs Premier Division and Cambs Division One competitions also finish tomorrow. (11.30am) Premier Division: Horton House v Oundle, Peterborough Town v Geddington. (Noon) Division Two: Long Buckby v Peterborough Town 2nds. (Noon) Division Three: Oundle 2nds v Horton House 2nds. (Noon): Sleaford v Bourne, Spalding v Market Deeping. (Noon) Division One: March v Ketton, Ramsey v Eaton Socon, Saffron Walden v Wisbech Town, St Ives v Nassington. (Noon) Division Two: Castor v Ufford Park. 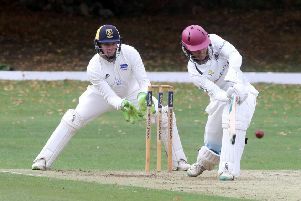 (1pm) Premier Division: Bourne 2nds v Spalding 2nds, Market Deeping 2nds v Stamford. (1pm) Division One: Belton Park v Welby Cavaliers. (1pm) Division Two: Long Sutton 2nds v Grantham 4ths. (12.30pm) Division One: Barnack v Market Deeping, Grantham v Nassington, Oundle v Bourne. (12.30pm) Division Three East: Market Overton v Long Sutton. (12.30pm) Division Three West: Easton-on-the-Hill v East Carlton. (12.30pm) Division Four East: Newborough 2nds v Market Deeping 2nds. (12.30pm) Division Four West: Peterborough Town 2nds v Bourne 2nds. (1pm) Division Two: Belton Park 2nds v Pinchbeck.